TORRANCE, Calif., Dec. 6, 2018 /PRNewswire/ -- Scientists from Honda Research Institute have collaborated with researchers at California Institute of Technology (Caltech) and NASA's Jet Propulsion Laboratory to develop a new battery chemistry that enables the use of materials with higher energy density and a more favorable environmental footprint than current battery technologies. The collective team of scientists co-authored a new paper on the topic that was published in Science and is available at http://science.sciencemag.org/cgi/doi/10.1126/science.aat7070. 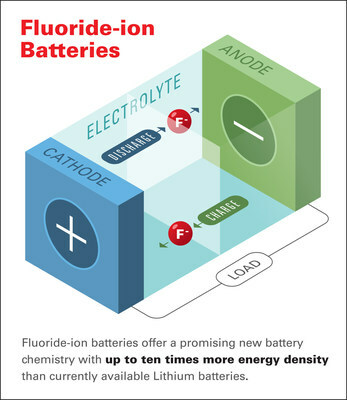 "Fluoride-ion batteries offer a promising new battery chemistry with up to ten times more energy density than currently available Lithium batteries," said Dr. Christopher Brooks, Chief Scientist, Honda Research Institute, and a co-author of the paper. "Unlike Li-ion batteries, FIBs do not pose a safety risk due to overheating, and obtaining the source materials for FIBs creates considerably less environmental impact than the extraction process for lithium and cobalt." FIBs provide an attractive alternative to other types of potential high-energy battery electrochemistries, such as those based on lithium- or metal hydride chemistries, which are generally limited by the inherent properties of their electrodes. Due to the low atomic weight of fluorine, rechargeable batteries based on the element could offer very high energy densities–up to 10 times greater than the theoretical values for lithium-ion technologies. However, while FIBs are considered a strong contender for the "next-generation" of high-density energy storage devices, they are limited by their required temperature requirements. Currently, solid-state fluoride ion-conducting battery iterations need to operate at elevated temperatures–above 150 degrees Celsius–to make the electrolyte fluoride-conducting. According to the paper's authors, these limitations in the electrolyte have presented a significant challenge for achieving low-temperature operating FIBs. Honda Research Institute USA, Inc.
Honda Research Institute USA, Inc. was established in 2003 as North America's advanced research center that provides innovative solutions to complex problems with direct applications to Honda's current and future technology roadmap. The team of scientists and engineers at Honda Research Institute create technologies, often generated through a scientific process, and apply them to real situations, addressing more than just abstract principles. Its core principles include maintaining a commitment to high quality and innovative research that supports Honda's short and long-term strategy, and fostering an open innovation model that establishes partnerships and alliances with academia and the private sector. Learn more at https://usa.honda-ri.com/.